Getting lost was the goal today and we managed that within blocks of our hotel. I swear, navigating Rome’s streets, alleys, and even pathways, is like trying to find your way in a rabbit warren. No rhyme or reason, certainly no grid pattern, and no map to be found that has all the streets labeled. I thought that was a problem with the maps, but I think it’s because those streets have no signs at all! But I have to say, getting lost was the best thing that happened to us because we happened upon many really great things. I think the story is best told in pictures, so here we go! 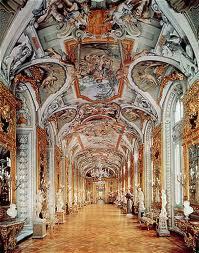 The Palazzo Doria-Pamphilij wasn’t the first place we found, but it was one of our favorites. We stumbled off the hot, crowded street, into this beautiful, cool courtyard. We also needed a bathroom, so buying an entrance ticket was a no-brainer. 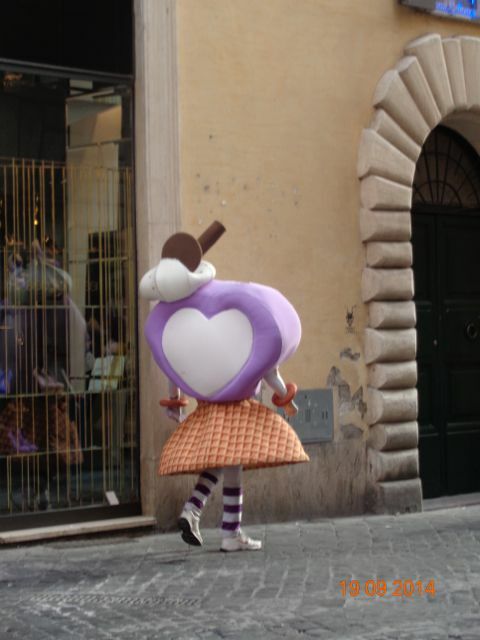 I think it turned out to be my favorite thing in Rome, so far. The Palazzo was built by the Doria-Pamphilij family in the 1600s and its been in the family every since. It’s a huge building and even though part of it is open to the public, the family still lives here. The room above was the first we entered (after the bathroom : ) The ceiling must be 20 feet, or more, so the room feels enormous. The walls are completely lined with paintings that were commissioned for this room. You can get an idea of just how big everything is in this room by looking at the chairs and sofas up against the walls. This is the only galleria where there are windows on both sides. Instead of paintings, they lined the walls between the windows with mirrors, so light is reflected everywhere. The incredible ceilings are well lit and absolutely mind boggling in their beauty. It was a magical corridor. This is one of the many galleries. 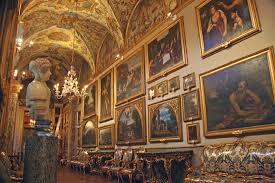 They are hung with paintings collected by members of the Doria-Pamphilij family for centuries. Many were purchased directly from the artist or commissioned by family members. Somewhere in the past, an ancestor found a way to prevent a member of the family from inheriting the art if he/she didn’t agree to keep the collection together. The current owner says it is both a blessing and a curse because the responsibility for keeping the collection is huge. I loved this room because its the ballroom. It is actually two rooms, both covered in beautiful silk wallpaper. The floor is parquet wood, perfect for dancing. On the far left side, you can see the little area where the orchestra would have sat. We saw many other incredible rooms of the Palazzo (which means “palace” in Italian), but taking pictures wasn’t allowed. Most I’ve included here came from the web. If you ever get to Rome, you must plan a visit here. It’s well worth a couple hours of your time. 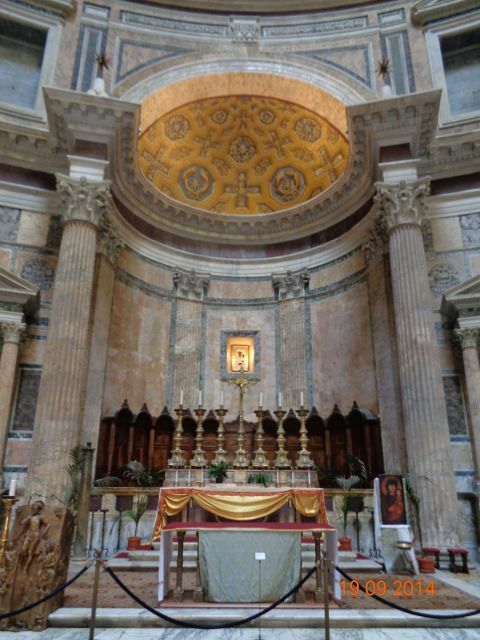 Next was the Pantheon, or as it’s known today, the Church of Saint Mary of the Martyrs. It is the best preserved building of Ancient Rome because it was converted to a church during the 2nd century. If you were curious about where all the bones from the catacombs we visited the other day, many were moved here. It was thought appropriate at the time because they believed many of the bodies buried in the catacombs were martyrs. This is the alter inside. It’s one of the few churches we’ve been in that actually has pews and a posted Mass schedule. The church is also the burial place of Raphael, yes, THAT Raphael. Here’s my attempt to show you just how big this building is. Its either the largest dome, or the second largest, in the world. It’s an engineering marvel that the Emperor Hadrian was said to have personally designed. The scale is huge and the opening at the top, known as the oculus, is 9 meters wide and completely open to the elements. When it rains, it rains in a perfect circle in the church. Yes, there’s drainage that appears to work well, because it doesn’t seam to be a problem. The second photo above is actually three separate photos, all hooked together. It was the only way to get everything in one shot. 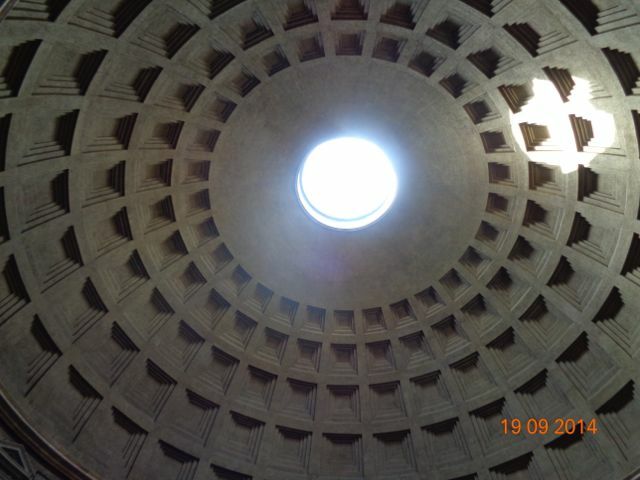 If you overlap them in your mind, you can get an idea of what the inside of the Pantheon looks like. This is the fountain outside the Pantheon. As you can see, it is another Egyptian obelisk. These obelisks are real. They were made in Egypt about 1300 B.C. and brought to Rome around the time of Christ. You can tell that this one was “exorcised” of any demons because a Christian symbol has been added to the top. But up close, you can still easily see the Egyptian markings. I think this one used to be in Helios and was also at Circus Maximus for centuries. 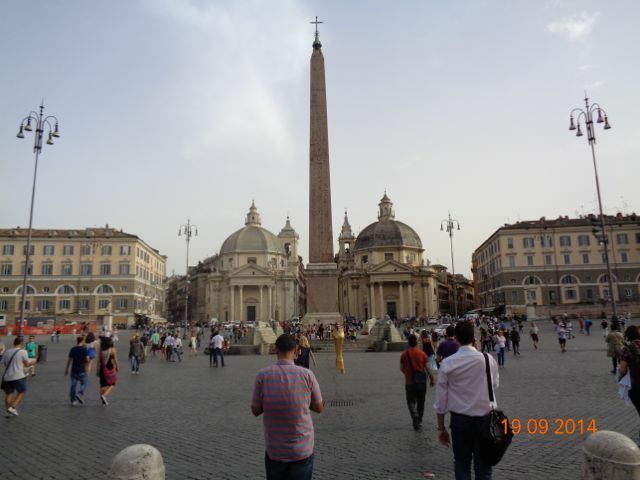 When Christianity rose in Rome, many of the obelisks were removed from the city’s older buildings and put in front of churches. It was sort of an ancient map quest device. It let pilgrims know which buildings were important to visit. Here we are! And yes, that’s a horse-drawn carriage behind us. I can’t even begin to imagine taking a carriage ride through Roman traffic. It’s completely horrifying. 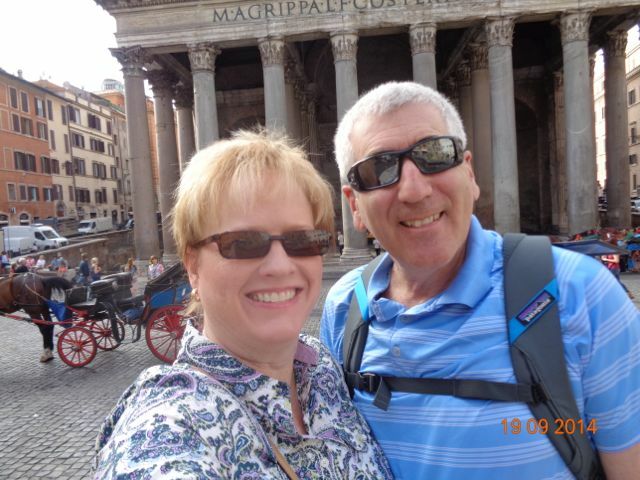 That’s also the entrance to the Pantheon behind us. We are standing on the steps of the fountain in the pictures above. 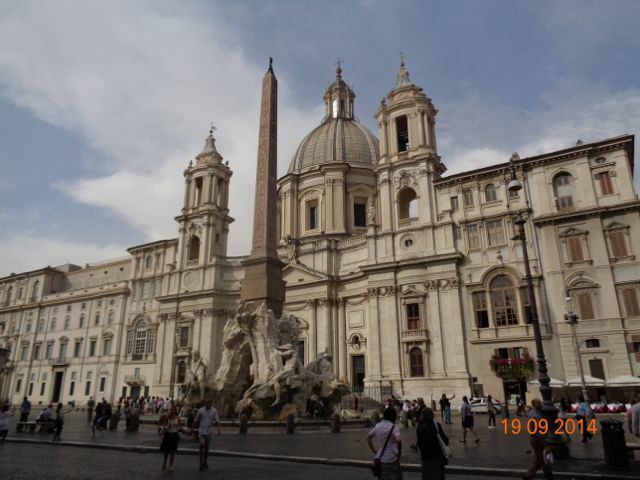 This is Piaza Navona. 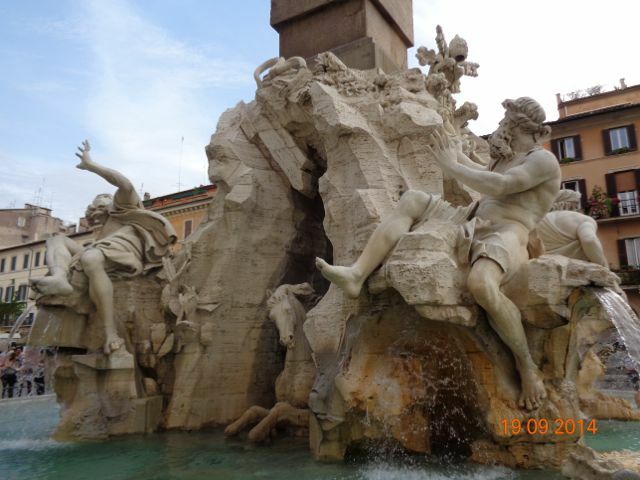 It has several fountains by Bernini, a very famous sculptor and architect. 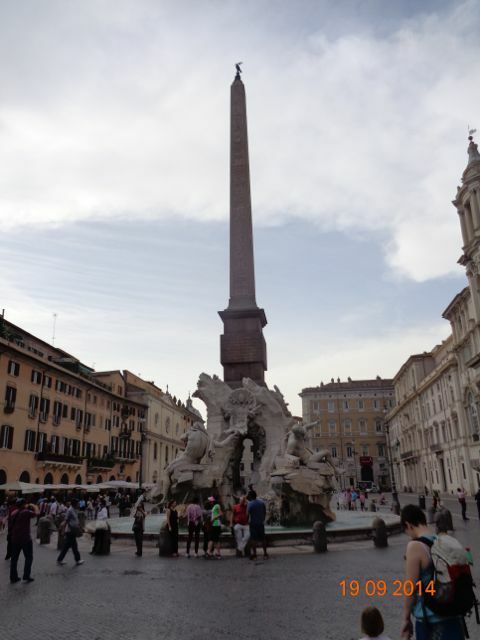 It is said that in his lifetime, Bernini created over 3000 sculptures, including the Tevoli Fountain. He also had something like 11 children, so he was a busy guy. 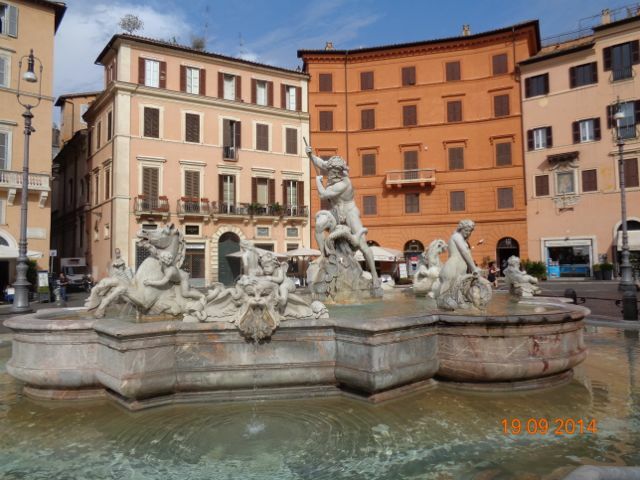 Another fountain in Piaza Navona. 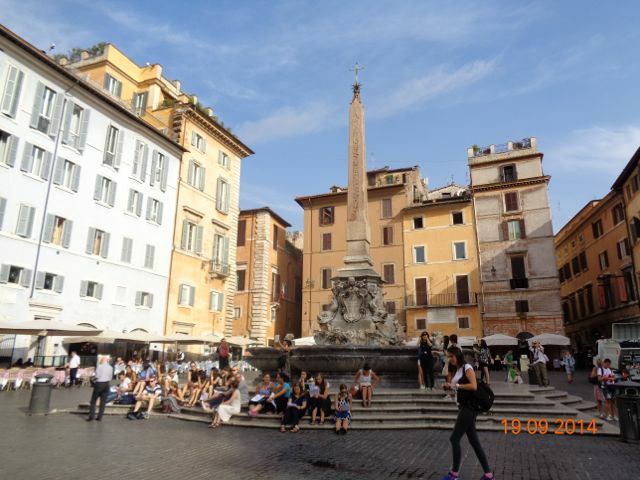 This is the famous fountain in Piaza Navona. It represents the four great rivers of the world. Okay, this one had me in hysterics. 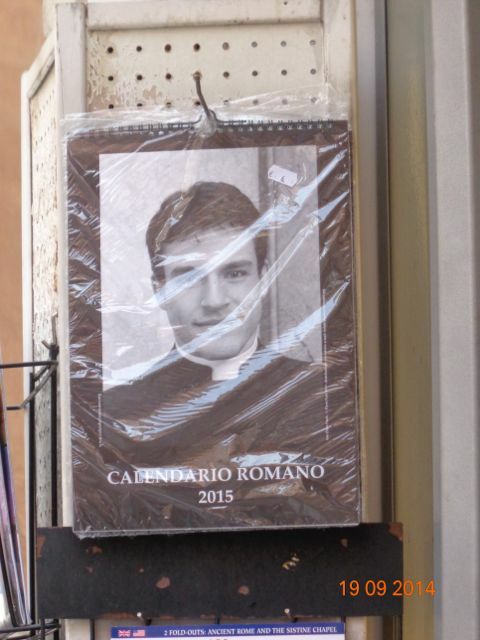 Only in Rome would hot priests make it in a calendar! 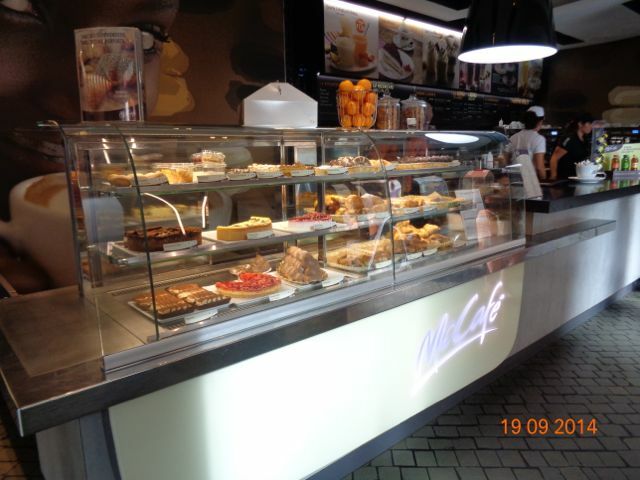 We saw signs for McDonalds everywhere. They always had an arrow and “3 minutes” if you walked that way. But we could never actually find one. Well, we discovered why. The one we stumbled on by accident was just a doorway that lead down steps, like you were walking into a subway. The McDonalds was way under the building and way back off the street. It was also enormous — like the size of a high school gym. 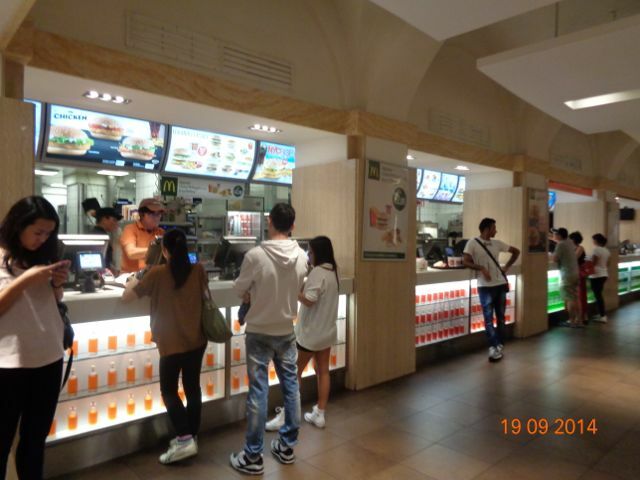 There were many walk up counters and I couldn’t see the end of the seating area. 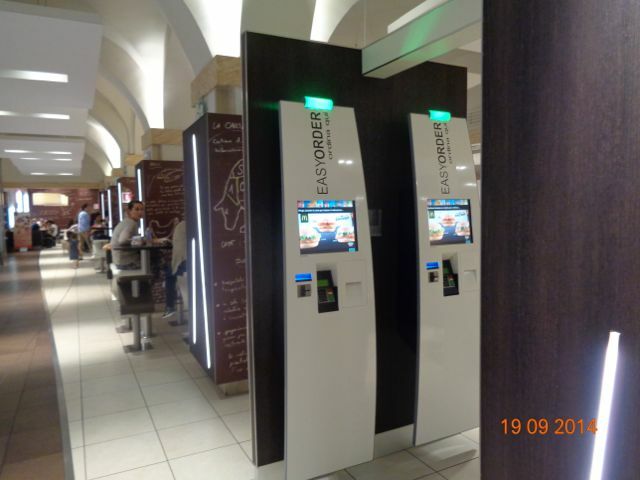 There were also about 20 of these self-order stations. And what’s up with the menu? We only get cruddy fried apple pies. 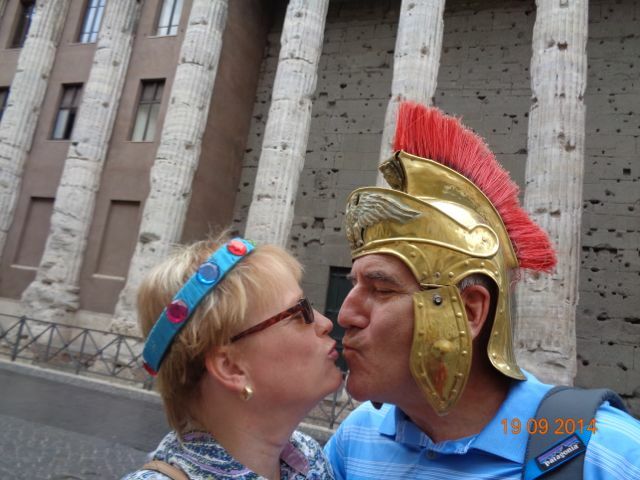 I want what the Romans get! 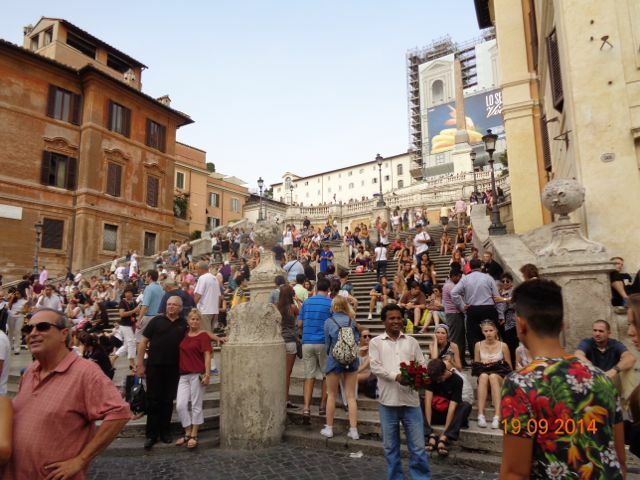 The Spanish Steps were more involved than I originally thought. I thought it was a staircase. No, it’s actually a series of staircases. At the end of a long day, it about did me in. So I stopped on one of the landings to take a picture. My favorite part is the father patiently letting his son wear himself out by climbing and climbing and climbing. I predict that kid will sleep well tonight! This is Piaza Del Popolo. It’s huge and was full of people, but there wasn’t much else here. Well, except for another obelisk. 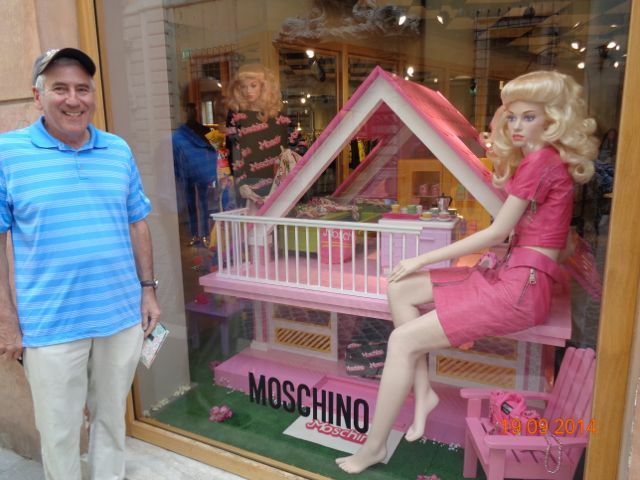 Bob meets Barbie! She invited him to her house. 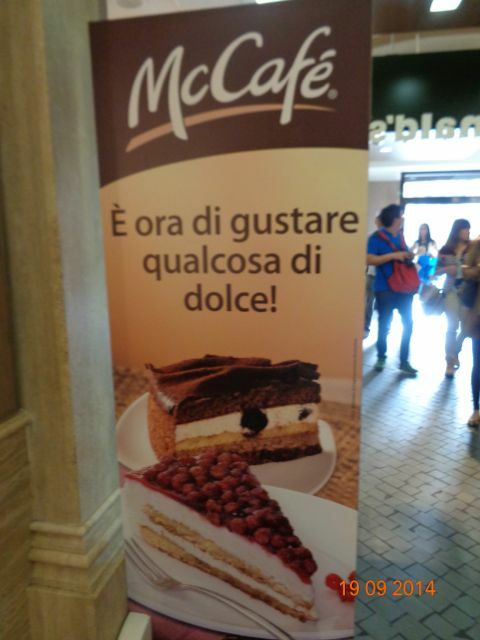 Apparently not all Italians are known for their pride. 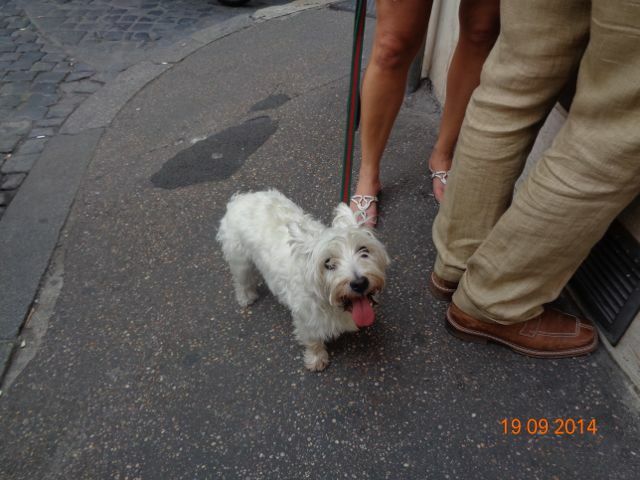 When I took this picture I thought “Italian Westie!” but after chatting with the owners, this is actually a Swiss Westie on vacation. 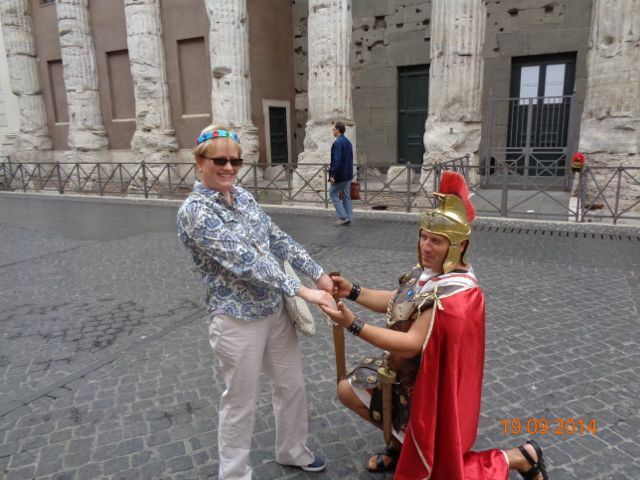 We got it on good authority that he really hates Rome and is looking forward to going home.